The Conservation Conversation: Is climate change the greatest threat to biodiversity? In 1984 Jarod Diamond synthesised the threats facing biodiversity and famously came up with his “four horsemen of the ecological apocalypse” – 1. Over-exploitation, 2. Introduced species, 3. Habitat destruction and 4. Chains of linked extinctions – with the recent addition of a fifth, 5. Climate change. 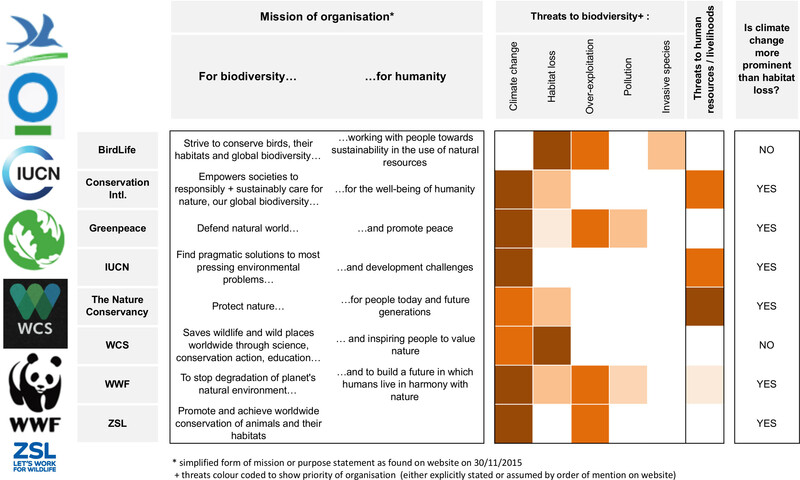 While these threats are not independent of each other, it can be useful to identify which are the most urgent in order to prioritise conservation actions. At October’s Conservation Conversation here at Stirling I asked researchers, “What is the top threat to biodiversity?” Most attending the discussion said “habitat loss” or “habitat degradation”. I was surprised that not one person said “climate change”. I grew up in the 1990s as an environmentally aware kid and was inundated with campaigns from my favourite NGOs about the imminent threats of deforestation and large-scale land-use change across the world. However it appears the environmental agenda has moved on, and in the 2010s talk of deforestation and land-use change has been replaced with climate change. Clive Hambler, in a provocative article for ECOS in 2013, argues, “… some NGOs have lost perspective and now obsess with preventing climate changes…” In anticipation of the COP21 climate talks in Paris this November, I set out to understand this a bit more and explore the relationship between habitat loss and climate change as threats to biodiversity. Do environmental organisations promote climate change as the greatest threat to biodiversity? For these top eight global environmental organisations, climate change is the top priority for five, and second priority for two, whereas habitat loss is top priority for only two. Climate change is undoubtedly promoted as a greater threat than habitat loss by these organisations and is more prominent on their websites as an issue that they are tackling. Is this because these organisations have embraced climate change as the greatest threat to biodiversity? Well it’s hard to say, because their missions are no longer only concerned with biodiversity. Of these organisations, only ZSL doesn’t explicitly mention people in its mission statement, while BirdLife only mentions people as stakeholders they are working alongside, rather than for. Unsurprisingly then perhaps, they are also the only two that don’t prioritise climate change over habitat loss. It’s reasonable to assume priorities are linked to mission, so does this really just reflect a paradigm shift, that environmental organisations are promoting climate change as the biggest threat because they are now concerned with humanity, alongside or in some cases rather than biodiversity. Do scientists think climate change is the greatest threat to biodiversity? In the most recent Living Planet Report (2014) from WWF, ZSL and others, it is claimed that population sizes of vertebrate species have halved over the last 40 years. Threats causing these declines have been identified as: Exploitation, Habitat degradation/change, Habitat loss, Climate change and Invasive species, in decreasing importance. In 2004 Thomas et al. modelled extinction risk from climate change and came up with the now famous statistic of “up to 37% species committed to extinction by 2050” quoted in the most recent IPCC report. Mark Urban recently published a meta-analysis of 131 predictions of climate-induced extinction and found that extinction risks will accelerate with future global temperatures, threatening up to 1 in 6 species. They found this risk was not specific to taxa, but did vary by region with South America, New Zealand and Australia most at threat due to high numbers of endemics and limited contiguous landmass for organisms to move to. Urban cautions that the influence of climate change (changes in distribution, behaviour and interactions) is likely much greater than induced-extinction. In 2000, Sala et al. ranked the importance of different drivers of biodiversity change and found that land-use change is likely to have the greatest effect on biodiversity overall in terrestrial ecosystems, with climate being more important in arctic, alpine and boreal biomes only. In comparison, in 2004, Thomas et al. used their global model to compare extinction risk from different threats, and made the case that climate change is now a greater threat to biodiversity than habitat loss. Undoubtedly climate changes will influence biodiversity. In the short-term we should expect to see changes in distribution and behaviour (e.g. phenology) but how much of this will lead to species extinctions is up for debate because species’ adaptive capacity to this rate of change is unknown. Why are NGOs and scientists at odds? Habitat loss is a harder argument to make for human wellbeing. Many will be delighted (including myself), that finally environmental orgs not only recognise that human activities impact natural systems but also that humans are an integral part of the natural system and that human needs are important. Habitats supporting high biodiversity are undoubtedly linked to human wellbeing, but in a sort of indirect way, they are generally not where people live. Where as climate change with its predictions of extreme weather, raising sea levels and impacts on agriculture is directly linked to human wellbeing. Habitat loss is a tricky political issue. Habitat loss from land-use change is primarily occurring in poor tropical countries – for means of development. It’s already happened in richer Northern climes ( I wrote on this a while back in this blog post). When environmental organisations put the wellbeing of people in their mission statements, habitat loss becomes a more difficult issue to address. In contrast, anthropogenic climate change is driven by high-consumption from rich countries and climate change action may result in money for poor countries (e.g. carbon credits). A recent article by Dickman et al. (2015) suggests that conservation issues in richer countries are easier to be objective about. Telling poor countries what to do (e.g. how to use land) is distinctly unpopular. Climate change finally has a seat at the table. Another suggestion is that against fierce political opposition, people have had to fight a long time to get climate change a seat at the international table of issues. Now it has one, organisations are scared to let it slip to second place. The negative result of this though is that environmental organisations and indeed scientists feel obliged to make some comment on climate change, as if they don’t, they fear they will be labelled as climate change deniers. Climate change will undoubtedly influence living organisms, with some winners and some losers. It has the potential to be a major threat to biodiversity, leading to widespread extinctions if species tolerances are pushed beyond their limits and lag-times to extinction (extinction debt) may mean that these effects may not be measureable for some time. In my opinion, taking a precautionary approach to climate change is wise, but in doing so, lets not take our eyes of the ball and let biodiversity slip away in the mean time. In this century, habitat loss remains up there as a major threat to biodiversity. Let’s make sure we don’t forget it. This was a post inspired by STICS’ “Conservation Conversation” series, an informal lunchtime discussion on topical issues held on the last Friday of every month. For more information contact Emma Bush (e.r.bush@stir.ac.uk). ← Are the simplest solutions ever the right ones?